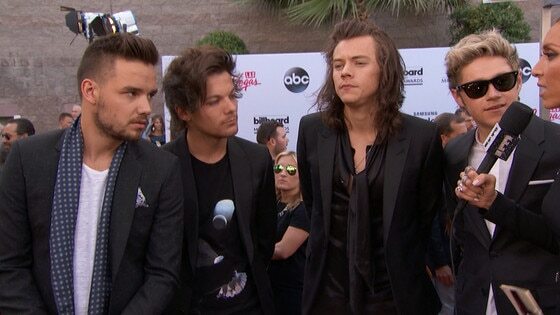 The boys of One Direction have made their first red carpet appearance as a foursome. Minus Zayn Malik—Niall Horan, Liam Payne, Harry Styles and Louis Tomlinson didn't let their newfound status stop them from making quite a handsome entrance at the 2015 Billboard Music Awards. The members of 1D are among the A-list presenters for the event held at MGM Grand Garden Arena in Las Vegas, including Kylie Jenner, Khloe Kardashian and the hunky cast of Entourage. Liam opened up about Zayn's exit to Giuliana Rancic while on the red carpet by stating, "Obviously a difficult thing to talk about. He left for his own reasons…You gotta do what you gotta do." The band still seems to be cordial about their somewhat severed ties as Liam continued, "He's sharing the experience with us even though he's not here." In fact, when the group picked up their award for Top Duo/Group, Liam couldn't help but give a shoutout to "our brother Zayn" who also deserved the award. Following Zayn's choice to leave the pop group, the remaining boy band members last appeared on James Corden's The Late Late Show. Liam shared how he felt when he learned that Zayn was quitting after a successful five-year run. "At first we were a little bit angry. We were surprised, but I think we all knew the general vibe that Zayn was feeling," he said. The 21-year-old went on, "There were certain parts of this job that Zayn loved and certain parts of the job that he didn't. If you don't like your job, you've got to follow your heart sometimes and go where you need to go. There's no argument with that." With their next album and tour being titled Four, it's pretty clear the boys of 1D are all about making their reprised image as they continue forth on their musical journey. Being the first band in the U.S Billboard 200 to have their first four albums hitting number one is not a shabby place to start!